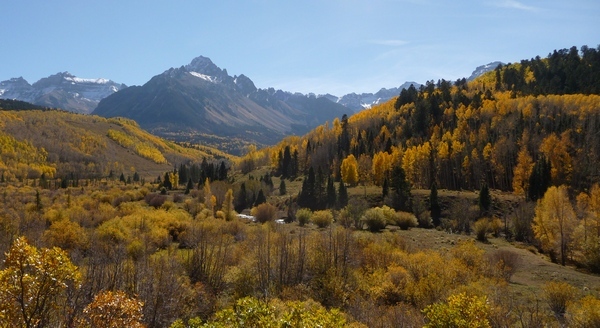 I'll lead off with this shot taken along Ouray County (Colorado) Road 7. Everything has turned color at once. That's Mt. Sneffels peeking (bad pun) out from behind. in pretty good shape. What amazes me is that even today (the 20th), the fall color is still up there! 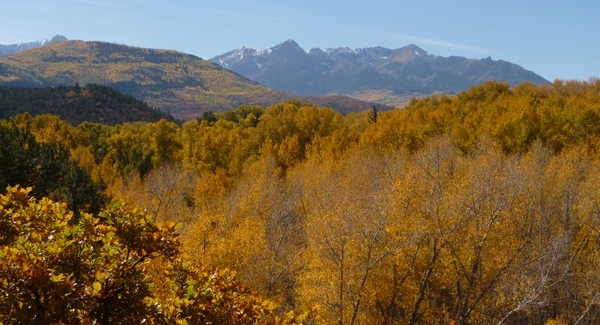 Normally most of the aspen leaves are down by around Oct 5th, and I’ve never seen the brush turn color at the same time as the aspens. 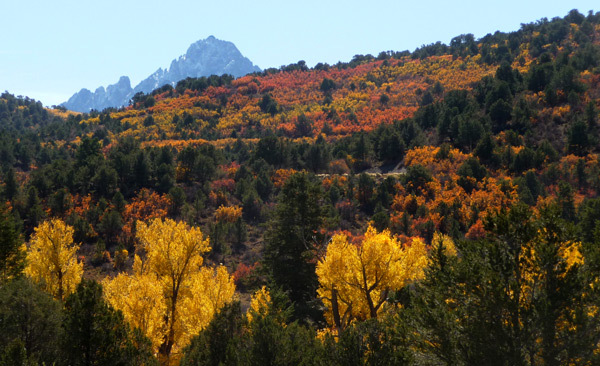 Lots of brush has turned color, with a palette rather more varied than the aspens. That's the Sneffels Range in the background. Interestingly, I didn’t need to Photoshop all these pictures—just the one at the top of the post, which was rather washed out in the haze. The rest of the photos in this post I merely cropped and resized with no further processing. Here's a shot you've seen before on this website. That's a small lake that holds back irrigation water. Mt. Sneffels is perfectly framed. Click here for a video showing the same scene as above, but in early spring. Click here for the GPS track and more pictures, also taken in May, plus here for pics of the wildflowers. Oh…the lake is private property and there’s a sign stating that quite clearly. Of course, it’s easy to crop out. Here's a view looking straight south at Mt. Sneffels. The broad canyon immediately in front is only about a quarter mile or so from the end of the road. Do you get the feeling I like Mt. Sneffels? I named my publishing site Mt. Sneffels Press. This valley shown above is pretty much the southern end of the private land—toward the center the road crosses into Forest Service territory. The road immediately gets more rough, but is not too bad. Yet another shot of Mt. Sneffels, this time from a trailhead a little to the west of Blue Lakes trailhead. I'm only a little bit east of where motorized vehicles can't go. That's Mt. Sneffels. The peak itself is on the right, and the massive formation that makes up some of the vee-shaped look of Mt. Sneffels from the north is actually that massive outcropping that you see coming left from the peak. Compare the picture above with this one taken on September 1st. Next, I’ll post CR 5 photos, some of the most spectacular of all! 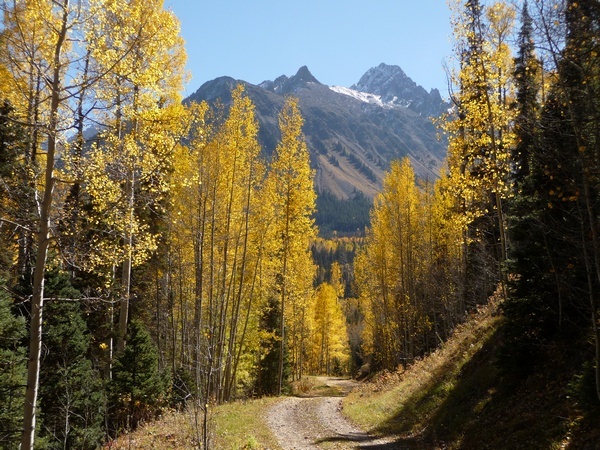 This entry was posted in Fall Color, Motorcycling, Ouray County and tagged dirt bikes, fall color, motorcycles, ouray county. Bookmark the permalink.